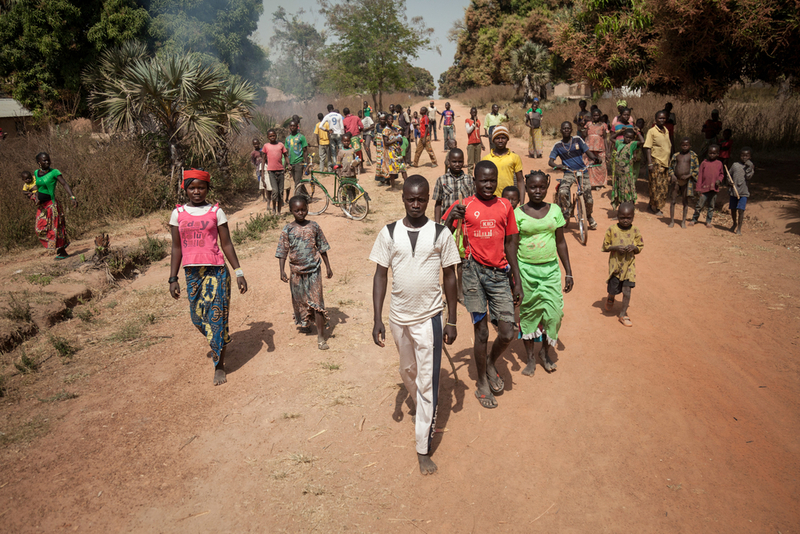 Ongoing political unrest and violence have resulted in a protracted humanitarian crisis in the Central African Republic (CAR). Despite its considerable mineral deposits and natural resources, it remains one of the top 10 poorest countries in the world. Years of unrest have displaced tens of thousands of Central Africans, with many crossing the border into Chad and is often effected by violence wrought in neighbouring countries like South Sudan. Amid shifting frontlines, thousands of people were killed, wounded or displaced as armed groups fought to take control of territory. Two Médecins Sans Frontières (MSF) workers paid the ultimate price and lost their lives while doing their jobs. Humanitarian needs are immense: limited access to vaccination and sanitation means that easily preventable diseases continue to take a toll. Malaria is endemic and the leading cause of death among children under five years of age. Mental health needs are also great, with people traumatised by violence and permanent insecurity. The health system is barely functioning, due to a severe shortage of skilled health workers and medical supplies. In 2017, non-state armed groups controlled 14 of the 16 provinces in this country of 4.5 million people. Thousands of civilians fled their homes because of fighting and violent attacks against them, taking the number of people displaced in recent years to 688,000 – around 15 per cent of the population. In neighbouring countries, the number of refugees from CAR rose to 545,000. The conflict directly affected the population’s access to medical care, food, water, shelter and education, and left them in a state of extreme vulnerability. Brutal murders took place, including summary executions, some of which were witnessed by MSF staff. Mother and her children fled their village of Pende because of violence committed by an armed group against the population. 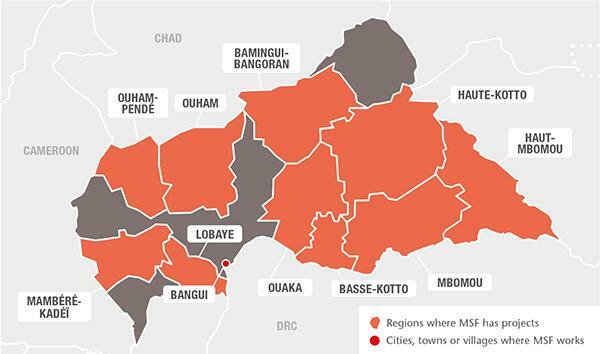 In 2017, MSF continued to offer outpatient and inpatient care to local communities and internally displaced people in 10 provinces. In Batangafo, Kabo, Boguila and Bossangoa (Ouham), Paoua (Ouham-Pendé), Carnot and Berbérati (Mambéré-Kadéï), Bangassou (Mbomou), Zémio (Haut-Mbomou), Bambari (Ouaka), Bria (Haute-Kotto), Alindao (Basse-Kotto), Ndele (Bamingui-Bangoran), Mbaïki (Lobaye) and the capital Bangui, teams provided basic, specialised and emergency care, as well as maternity and paediatric services. Staff assisted 17,855 births, performed 8,878 surgical interventions and carried out a total of 748,563 outpatient consultations. In 2017, MSF adapted six of its 17 projects (Bria, Bangassou, Batangafo, Paoua, Zemio and the emergency team, Eureca) to respond to the urgent needs of those directly affected by the spiralling conflict. In Bria, a surgical team was deployed between January and April to support the hospital’s regular paediatric activities, and to treat the hundreds of patients wounded in the ongoing clashes in the region. As Bria came under repeated attack, civilians who did not flee were trapped in their homes, prompting MSF to set up mobile clinics in a number of locations such as the PK3 displacement site. In May, open warfare broke out in Bangassou, where MSF had been supporting the 118-bed regional hospital and three health centres. As a result, the team adapted its response to address the needs of displaced people within Bangassou city and in Ndu village, across the border in the Democratic Republic of Congo (DRC). After several security incidents, a violent armed robbery at an MSF base on 21 November triggered the evacuation of the entire team and the suspension of activities for three months. In Batangafo, activities were particularly affected from July, when the hospital was transformed into a camp for displaced people. Due to the security situation, it was extremely difficult to run mobile clinics in the second half of 2017, but community health workers were able to continue their activities. The security situation in Paoua deteriorated considerably at the end of December. Fighting on the outskirts of the city displaced more than 65,000 people and forced MSF to end its support to seven health centres. Until then, the team had been running a primary and secondary healthcare programme, and had treated more than 1,000 patients for snakebites. After killing a snake, a green mamba, the villagers, reassured, return home. Paoua region, CAR. In Bambari and Kabo, MSF teams treated and referred many war-wounded patients who had come to their facilities from surrounding towns and villages. 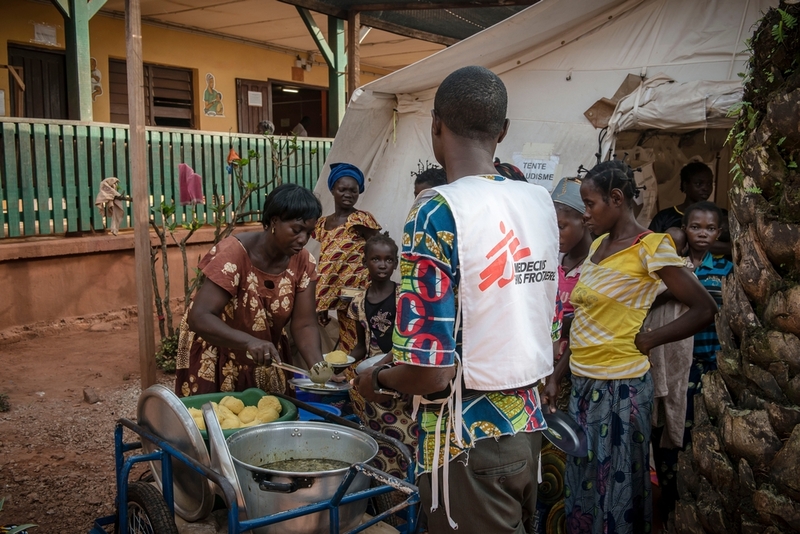 In Bangui, MSF provided care, including surgery, to victims of violence from the city and the surrounding provinces in its first district hospital. Teams treated victims of sexual violence and ran Castor maternity hospital, which focuses on complicated births, as well as Gbaya Dombia maternity facility for simple births in the PK5 area. In 2017, MSF carried out vaccination campaigns to protect children from diseases such as diphtheria, hepatitis B, measles and pneumonia in Lobaye and Carnot. Multi-antigen vaccinations were also provided by the Eureca emergency response team, and an additional vaccination campaign was launched in response to a measles outbreak in Mbaïki. The campaigns enabled a total of 185,400 children to be vaccinated. In Berbérati, 22,400 women of childbearing age were vaccinated against tetanus. 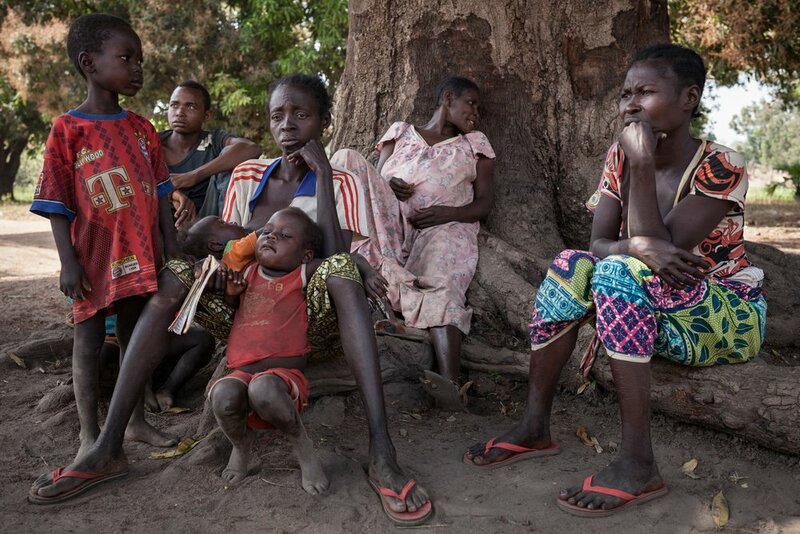 Teams continue to provide treatment for HIV/AIDS, TB and malaria in CAR. In 2017, MSF reinforced a community approach, setting up networks of community workers to treat malaria in Kabo and Batangafo, and offering free malaria testing and treatment in Bossangoa and Bambari. A total of 444,587 patients were treated for malaria in 2017. The HIV programmes in Paoua and Carnot focused on decentralising antiretroviral (ARV) treatment at primary healthcare level in challenging and low-resource settings. Efforts were made in Batangafo and Kabo to adapt the programmes to community models as the conflict made access to ARV drugs even more difficult. Following three attacks on the hospital in Zemio, which forced most of the population to flee, the teams managed to contact 1,200 of the 1,600 people enrolled in an HIV community-based programme and supply them with ARV drugs. MSF’s emergency response team in CAR, Eureca, is deployed for short-term interventions and temporary targeted measures. In 2017, it responded to violence, health and nutrition crises in Mbres, Maloum and Alindao, where the conflict had severely restricted access to food. The team also spent two months in Gbadolite in DRC, offering support to people from CAR who had fled over the border. In October, Eureca returned to Alindao in response to renewed fighting there. The team set up mobile clinics outside the town, as well as supporting the district hospital in its treatment of malnourished children. Despite growing insecurity in other areas of the country, Mambéré-Kadéï remained stable in 2017. After three years working in the hospital in the prefectural capital, Berbérati, and surrounding health centres, MSF handed over its activities to the Ministry of Health in September. Since the beginning of the project, MSF had admitted 20,700 children to the hospital’s paediatric unit, treated more than 4,570 children under five years of age for severe acute malnutrition and assisted more than 5,500 births. In Zemio, with the fighting over and the emergency response finalised, the project closed in December 2017.